Celebrate lifes special occasion with a brillinat combination of margarita and flowers. Hand gathered from the farms, this vibrant flower arrangement is perfect to lift up the mood. 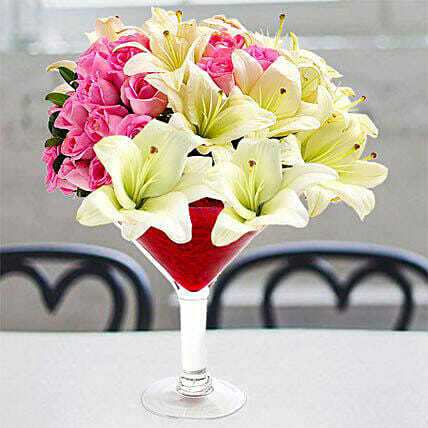 Break the monotony with this out-of-the-world arrangement of lovely roses and luscious lilies on a margarita glass. Give your loved ones just the kind of surprise that will put a smile on their face. Surprise the lucky recepient and create a celebratory atmosphere. A friend in the garden is a treasure whose worth cannot be measured except by the heart. Anon Meaning of flowers: Pink roses symbolize thankfulness, admiration, and happiness and white lilies symbolize chastity and virtue. "The delivery is always all time and the products are very fresh"
"Good job many thanks for the help."